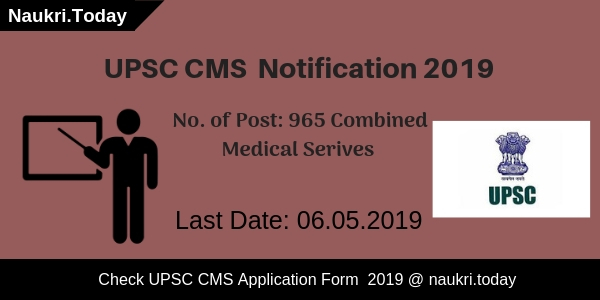 UPSC CMS Notification 2019: Union Public Service Commission has released the official recruitment notification for 965 Central Medical Services Jobs 2019. All the interested and eligible candidates can apply for UPSC CSM 2019 Exam from the official website. The UPSC CMS 2019 Online Application process has started. The students can apply online from 10th April to 06th May 2019. The last date for the online Payment Fee for the UPSC Combined Medical Services Examination is 06th May 2019. For more information regarding Union Public Services CMS Examination such as Eligibility, Vacancy Details, Application fee, Exam dates, etc., go through the information given in the article. What Is Application Fees, Selection Process & Pay Band for UPSC CMS Recruitment 2019? Candidates must have cleared the written & practical parts of the final MBBS Examination from a recognized university. Applicants should have the maximum age limit 32 years old as per UPSC CMS 2019 Notification 2019. For further more information candidates can check the UPSC CMS Notification at here. Visit the official website of Union Public Service Commission i.e. upsc.gov.in. Read the UPSC CMS 2019 Recruitment notification for eligibility and important instructions for filling of online form. Now, on the Homepage click on the link apply Online for UPSC CMS exam. Enter your personal details and upload your ID, Photo & Signature. Now Pay the CMS 2019 Exam Fee and submit your application. Now, download and take a print out of your Online generated CMS application 2019 for future references. Conclusion: UPSC CMS Notification Pdf 2019 is available here for Combined Medical Services Exam. Candidates can apply for UPSC 965 CMS Vacancies 2019 till 06th May 2019. Union Public Service Commission has published UPSC CMS Notification 2018 for Combined Medical Services Exam 2018. There is 454 Post of Assistant Divisional Medical Officer, Assistant Medical Officer, General Duty Medical Officer posts. All the details of UPSC Medical Officer Recruitment 2018 are given in the UPSC CMS 2018 Notification. Candidate can fill the UPSC Medical officer online application form before the last date 25.05.2018. You can check the other information for UPSC Medical officer Jobs/ UPSC CMS Vacancy from the below section. About Department : Union Public Service Commission (UPSC) established under Article 315. The Terms & Condition of Service of commission is governed by the Union Public Service Commission (Members) regulation, 1969. The major role of the commission is to select the eligible candidates through Combined Medical Services Exam 2018. It is great news for all those candidate who are waiting for MBBS Govt. Jobs. More Details about UPSC 454 Asst Medical Officer Vacancies like Qualification, Selection Procedure, Age Limit etc. are given in the below section. UPSC is inviting online application for those candidates who are looking for UPSC MO Recruitment 2018. Combined Medical Services Exam 2018 will held on August 2018conducted by UPSC dept.The applicant can utilize this opportunity by filling up online application form. Candidates kindly read full Notification then apply application care fully. After apply candidate should check eligibility details from UPSC CMS Notification 2018 article. Candidate should have MBBS degree/ Post Graduation degree or its equivalent qualification from any recognized university or institute. To Know more information about UPSC CMS Recruitment 2018 check the official CMS 2018 notification. Candidates must physically and medically fit according to the physical/medical standards for the Combined Medical Services Examination 2018. Applicants who are going to apply application form for UPSC CMS 2018 Recruitment, age should not more than 32 years as on 01.01.2018. Age relaxation of 5 years for SC/ST, 3 years for OBC, 10 years for PH Candidates. To get more information about Age details please refer official UPSC CMS Notification 2018. The candidates are required to pay a fee of Rs. 200/- either by depositing the money in any branch of SBI by cash, or by using net banking facility of the SBI or by using visa/master credit/debit card. SC/ST/PH/Women candidates are exempted from payment of fee for UPSC CMS Online Application Form. Selected Candidates for UPSC CMS Notification will get the pay scale as per the government norms. Post-Wise pay scale of Union Public Service Commission Vacancies 2018 which is given above table for UPSC MO Vacancy. Department of UPSC has recruited the talented applicants through selection criteria for Medical Officer Jobs. Candidates selection will be based on Written Exam & Interview. UPSC Firstly released eligible candidates list for UPSC CMS Notification 2018. The final list of the candidates for appointing post will be made on the basis of mark obtain in Recruitment Test & Personal Interview. After that candidates called for interview. Eligible candidates can attend interview & Bring your application form/ Documents at the time of interview. The candidates will take the Computer-based examination in two Papers, each Paper carrying a maximum of 250 marks. Each Paper will be of two hours duration. Total questions in Paper I = 120 (30 General Ability, 70 General Medicine and 20 Paediatrics). Total questions in Paper II = 120 (40 Surgery, 40 Gynaecology & Obstetrics and 40 Preventive & Social Medicine). Candidate who qualified in written exam then they call for interview(100 Marks). Applicants who have applied this UPSC 454 Asst Medical Officer Vacancies, then they can download the UPSC Hall Ticket. UPSC CMS Admit Card available 03 week before exam date by UPSC Department. So, candidate should touch with this website for UPSC 454 Asst Medical Officer Exam Hall Ticket. The results of the computer-based examination are like to declare in the month of September/October, 2018.
check the UPSC CMS Notification under the notifications. Read all the instruction/ Criteria carefully For UPSC CMS Recruitment 2018. Fill the UPSC CMS online application form with the essential details and Click on the submit button. Conclusion : The Union Public Service Commission has released a UPSC CMS Notification 2018 for Combined Medical service Examination 2018. Interested candidates should apply online application for UPSC CMS Recruitment 2018 before the last date 25th May 2018. UPSC CMS Application Form 454 Vacancies Notification.